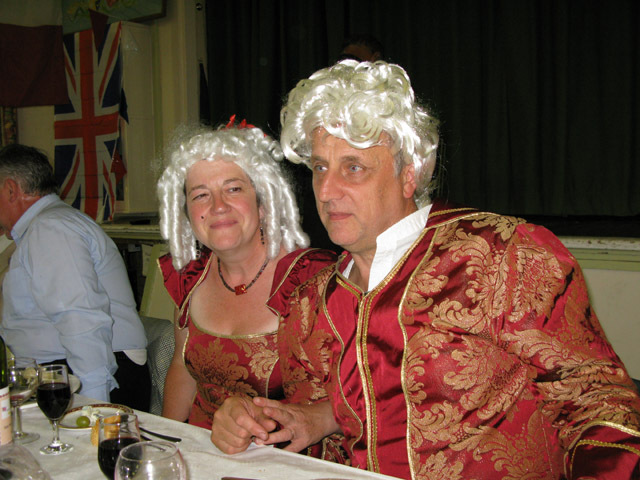 With the success of our first Bastille dinner in 2009, the committee decided we should host the event again this year. 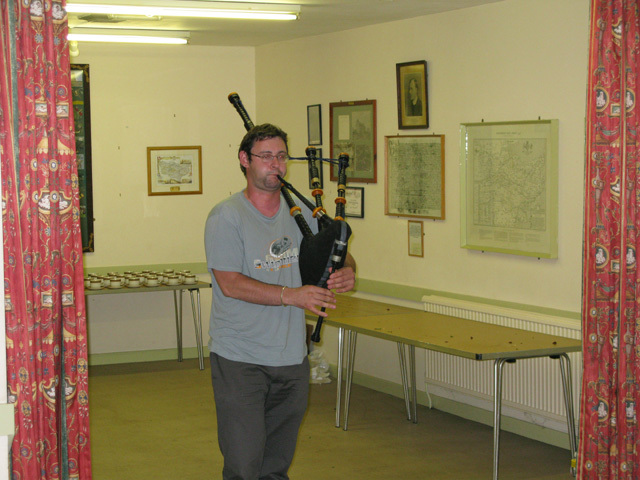 The 10th of July being the nearest available Saturday booking at the village hall, we went ahead. 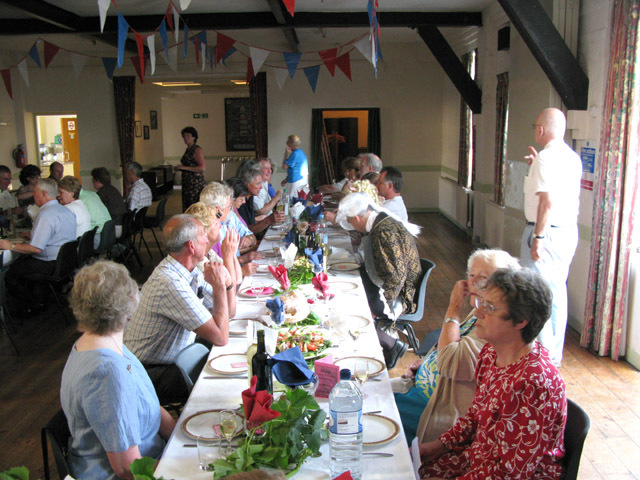 Christine 'volunteered' to organise the food again and having made such a good job of it last year, no-one wanted to dissuade her! 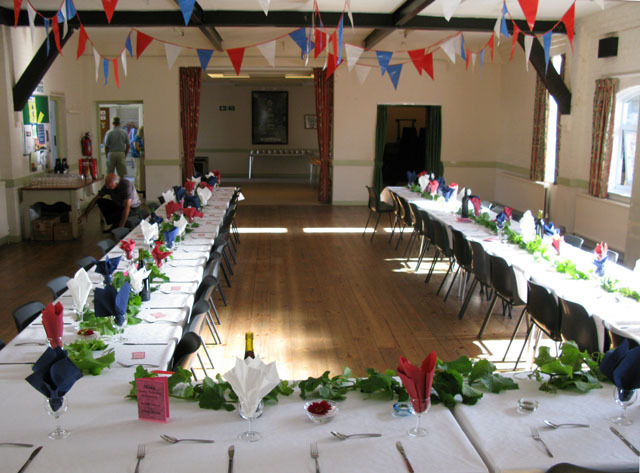 With the usual list of seemingly impossible tasks to complete in the time available, we set to and decorated the hall, laid out the tables and cutlery whilst Christine organised the volunteers in the kitchen. What could be done before-hand had been done but there was still a lot of work to do if we were going to provide the 50 diners with their food. 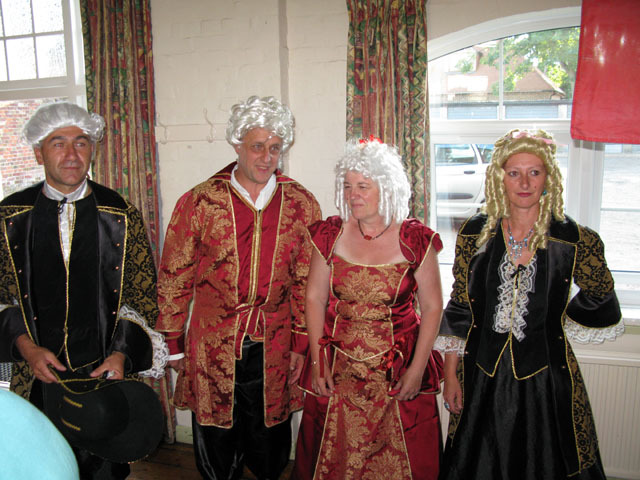 Needless to say, by the appointed time guests started to arrive and everything was in place, thanks to all the helpers. 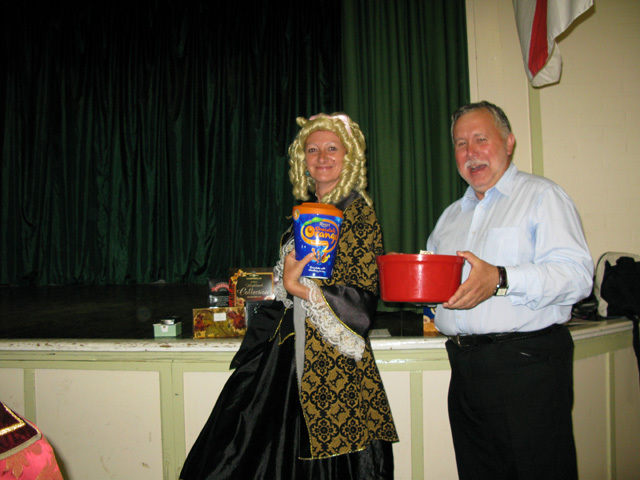 A welcome drink was provided (thanks to Robert and Christine for their generosity in donating these) and soon the hall was filling up. 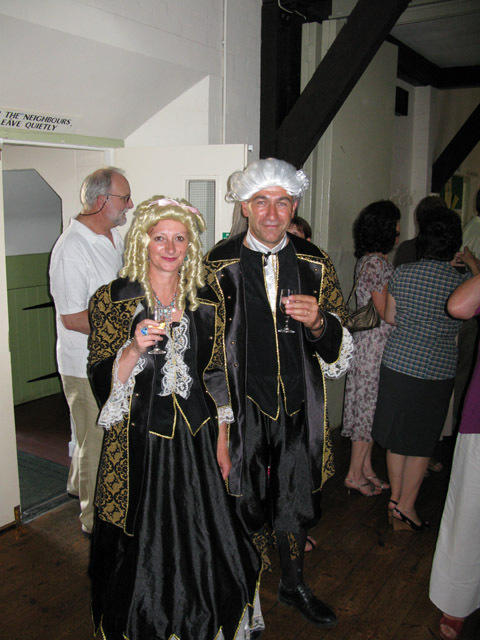 A ripple of laughter and applause broke out as our French guests made their entry; last year they had arrived dressed 'Sans-culottes' but this year they had elevated themselves to royalty and arrived suitably attired. 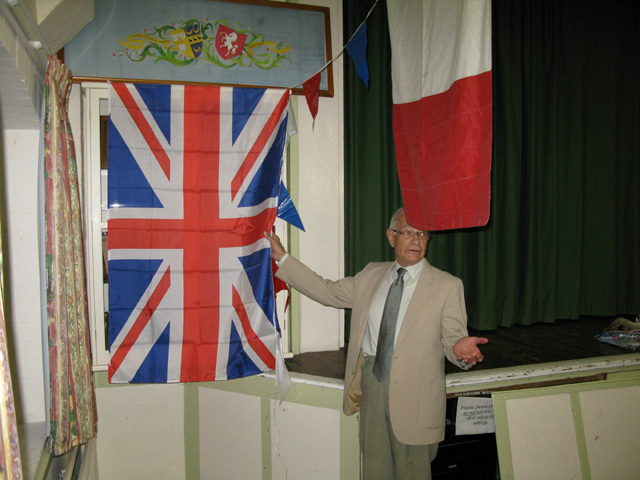 Together with our French guests we were very pleased to have with us the first ever chairman of Eastry Twinning, Donald Eldridge and his wife Hazel. Donald was asked if he would perform an unveiling of our new Twinning display cabinet. 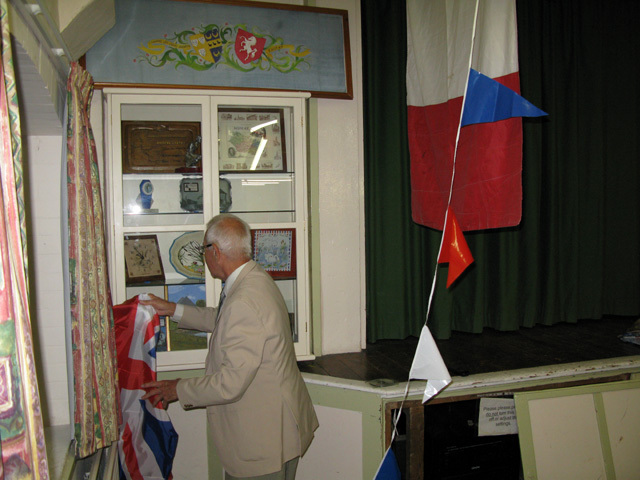 For many years the gifts received from Longpré had been out of sight to many, so now, with the kind permission of the Village Hall Committee we had a proper place to display the memorabilia of 30 years twinning. 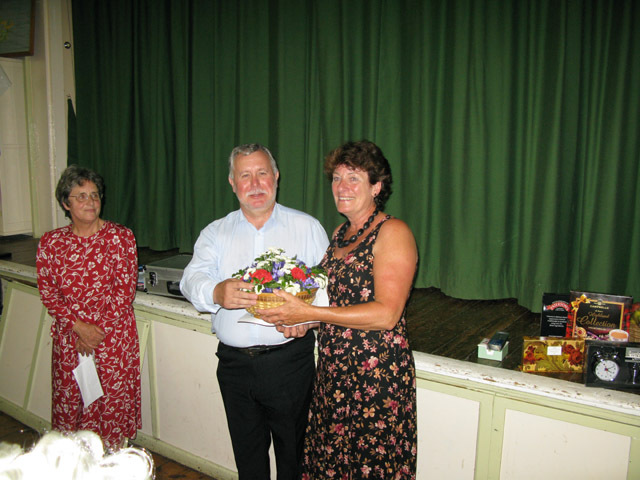 After the unveiling, a bouquet of flowers was presented to Hazel Eldridge and then the chef de cuisine Christine Green was presented with a bouquet to show our appreciation of all the work she had put into the event to make it the success it turned out to be. During the superb 4 course meal (see menu below) we were entertained by a magician who performed his magic tricks at the table [still very difficult to see how he did it, even at that range!]. 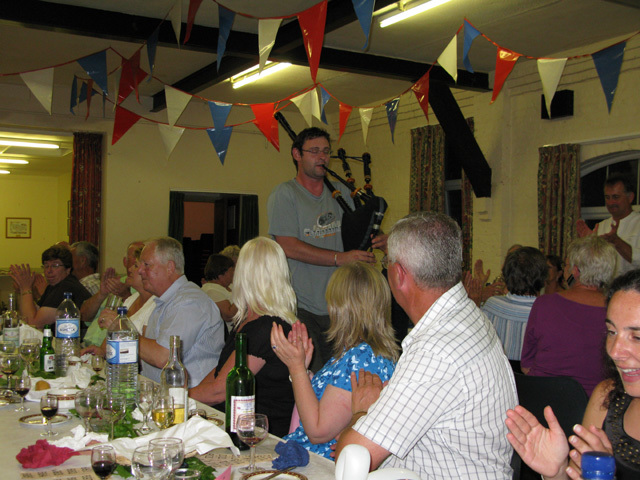 After the meal everyone was very surprised to see our next guest, all the way from Brittany (well originally anyway), George Assaf - a bagpipe playing Frenchman - a bit 'off the wall' but very entertaining and much enjoyed by everyone. Coffee, port (generously supplied by Bill and Hazel Clague) and cheese finished the meal - it had been another triumph. 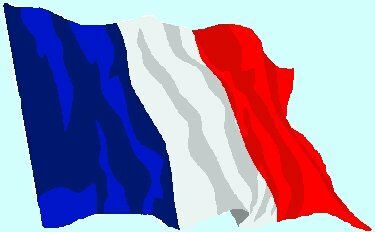 Please Note:- Owing to the enormous amount of work involved it has been decided that we would make the Bastille Dinner a Biennial event to be held in the years following the visit from Longpré twinners, so the next dinner will be held in 2012. Thanks to everyone who helped make the evening a success and to those who supported us. See menu and photos below. 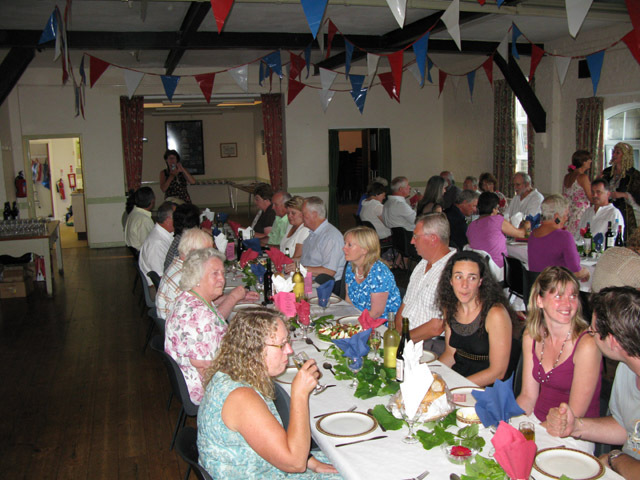 Red and white wines courtesy of Eastry Twinning Association. "Let them eat cake" Yvette claims her raffle prize.